As an official Pittsburgh Public Schools After School and Out-Of-School Time Program, we share their common goals of being committed to deliberately preparing students for life after high school throughout their educational experience, by increasing and strengthening after-school opportunities for children so that they are successful in school and in life. Ruth’s Way, Inc. is a participating Behavioral Health Service Provider with the Allegheny County Department of Human Services’ (DHS) Children, Youth and Families/Behavioral Health Community of Practice. Within this Community of Practice, we have joined child welfare providers, DHS and Community Care Behavioral Health staff, and Court of Common Pleas of Allegheny County, Family Division personnel in a combined effort to serve the families involved with the child welfare system in the provision of services and specializations that contribute to a robust continuum of care including mental health, substance abuse and co-occurring services, community-based and out-of-home care for both children and caregivers. The Community of Practice also serve families who are at-risk of losing custody of their children to the child welfare system as well as families who have already lost temporary custody and are working to reunify with their children. As a Live Well Allegheny Community Partner, we share their mission is aiming to improve the health and well-being of Allegheny County Residents, and making Allegheny County the “healthiest county” in the nation. As a Behavioral Health agency, Ruth’s Way, Inc. forms a team of phenomenal Behavioral Health Professionals, composed of Achievement Consultants who are SFW (Strength-based Family Worker) credentialed Family Workers and Therapeutic Clinicians who are Licensed Professionals. Provides our clients with campus tours, information, literature, application processing to provide a smooth transition to secondary education enrollment with their agency. Provides our girls who pursue enrollment with valuable career training opportunities and placement upon graduation. Provides a variety of event tickets to our clients while fulfilling their mission of enabling underprivileged children and their families to fully participate in the enriching resources our community has to offer, including cultural, sporting, educational, and entertainment activities. Provides professional attire, a network of support, and career development tools to our clients ages 18-21 to help them thrive in work and life. 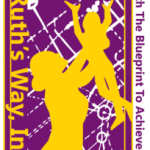 Provides Ruth’s Way, Inc. with supplies of diapers and wipes for the children of our clients. Has provided us with a vast quantity of Lego Blocks and Building Sets to provide to the children of our clients. On June 7, 2014 hosted our community event/fund-raiser “Where Are You?” an open forum for adolescent girls and professional women to communicate with the goal of eliminating the biases that exist among them. Gwen’s Girls provided their facility as our event site and we presented our venue to their clients, staff, and persons from the public. Ruth’s Way, Inc. is currently enrolled as a fee-for-service medical provider under programs administered by the Pennsylvania Department of Public Welfare (DPW) to provide Medical Assistance Case Management for persons under age 21. Through the PNC Community Development Banking program, PNC bank provides financial education seminars to give our clients the confidence, information, and tools needed to make informed financial decisions that help them to achieve their goals. Provides therapeutic treatment and counseling services for our clients who require mental health evaluations and/or services. Promotes access and business opportunities for African American business owners and professionals throughout the region. Provision of organizational development assistance through their mission of revitalizing, strengthening and producing healthy, self-sustaining communities through innovative programs and projects that put community members and stakeholders in the forefront of economic growth and self-sufficiency.